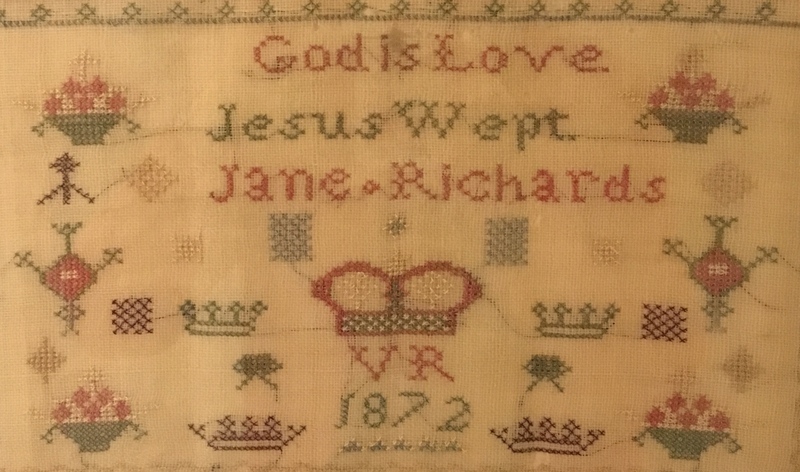 Above a section of my Great-Grandmother’s sampler, completed age 7. My grandfather’s family were from the Isle of Wight. For generations Richards and Mabeys lived in the environs of Newchurch. Stephen Richards built a house at Branstone in the 1700s, which still stands; ‘Headley House’ (so named for being the first house in the village). There is not so much of Branstone now. Jane Richards married John Mabey in 1882 and they lived at Headley House until her death in 1944. She bore 12 children, and had three grandchildren. None of the six surviving daughters married, for the ‘Great War’ took the young men that would have been their suitors. 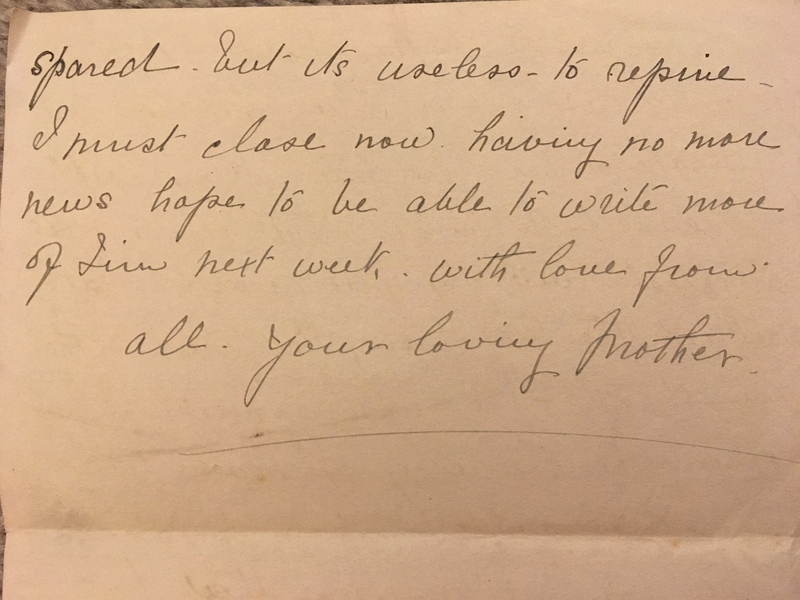 I know the letter that I hold in my hands is near one hundred years old, yet its age is betrayed neither by fragile paper nor faded ink but by the script of my great-grandmother’s handwriting. Jane Mabey writes to her son John and the content is timeless. I am struck by how my own mother might have written such a letter to me, on subjects of weather and family friends and that self-deprecating “nothing in the way of news”. And yet there is an out of the everyday and ordinary about this letter – for Lloyd is missing and Jim’s whereabouts are unknown, although the family know he was gassed. My great-grandmother’s anxiety and sorrow is simply, humbly expressed and no less powerful for that. It is her loss, and abiding love for all her children that transmits through the pages so long after the heart that beat for them has ceased. Lloyd and Jim were my grandfather’s younger brothers. Lloyd did not come home. I daresay you have been looking for a word from me but I have waited till today to see if anything came from Jim. I wonder if they are only allowed to post one letter weekly, it would mean a lot of trouble if there are many of them and they all wrote as often as they wanted. Uncle and Auntie Sprack had a letter last Wednesday. It was written on the day after mine Jan. 28th but not posted till Feb. 1st. There was nothing fresh in it, only to wish them good wishes for the year and he said he was just going to have 1 and a half inch needle put into his leg to make him well. So I hope we may get another letter next week. Oh how glad I shall be when we can once more get in touch with him and get answers to our letters, the time seems endless. I was glad to get your card and hope you did not renew your cold. The weather has turned to wet again and not very warm but it’s nice to be not so piercingly cold as it was the beginning of the week. Mabel Merwood was married today. Not much sunshine for her. A letter came for Jim from Victor, he is demobilised and has set up housekeeping in Newport. He said he had just got a letter returned that he wrote to Jim in July. You will be pleased to know that Ursie was delighted with the new records. Pat put up the big horn this week and they sound lovely. I’m afraid I have nothing in the way of news. Your Dad was called upon to shoot a horse for Mr Mayow. That has been the chief excitement of the week. I suppose you have heard nothing more as to Lloyd? My heart is full of sorrow when I realise that I shall see him no more. I dearly loved the lad as I do all of you and I had fondly hoped that he might have been spared. But its useless to repine. I must close now having no more news. Hope to be able to write more of Jim next week. With love from all.